Step 1. Using hot melt glue, attach a mini pine cone (head) to the top of a large pine cone (body). Step 2. Take two 15cm chenille stems and cut in half. Position stem pieces around the pine cone body to create legs. Step 3. Make the reindeer’s tail and ears from another chenille stem. Glue all stem pieces in place. Step 4. Model two antlers from a tinsel stem, and glue in place. Step 4. Thread a folley bell onto a length of jute string and secure with a knot around the reindeer’s neck. Step 6. Glue on joggle eyes and a pom pom for a nose. Step 7. 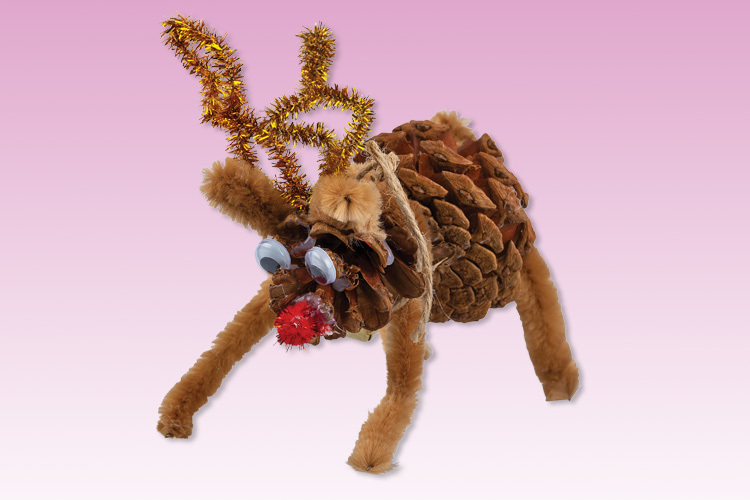 Position the arms and legs so that your Pine Cone Reindeer stands!